Barcelona is a cosmopolitan city with beaches at a walking distance from the shops. A must see location for architecture lovers too. As with any large city the variety of restaurants and shops is huge. Barcelona is also a destination on many cruise ship routes. Since 1992 it has become increasingly popular as a tourist destination since the Olympics. Even if you only have a short time in the city on a business or a layover. These tips will help you optimise your time. The mild climate and vibrant atmosphere of the city make it a popular weekend destination for many visitors. For great food with a view head to Agua or Bestiary, these beach front bars are in the Vila Olimpica area. Take the Metro yellow line. For typical Catalan food, there are two clear options. El Mussol. (Meaning Owl in Catalan) with several locations around Barcelona they offer good quality food and its good value. If you are looking for a dining experience and want local food, check out Opera Samfaina in Las Ramblas. 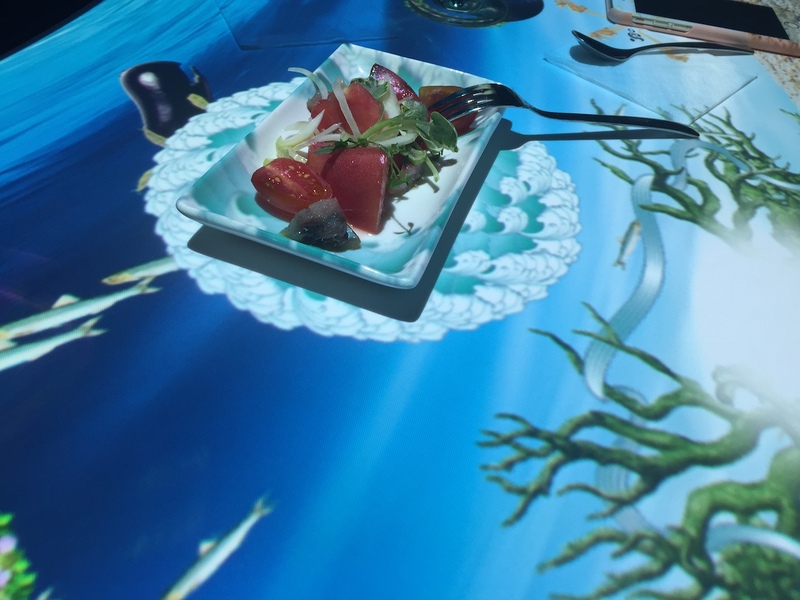 This restaurant mixes food culture with lights, music and an entire show. Book the Odyssey and Diva Experience and enjoy the evening to the full. Other venues such as Semproniana in the Eixample or El Pla in the Barrio Gotico offers local market food are other good options in the Catalan Capital. For drinks or snacks head to Cervecería Moritz. This funky beer factory smells aromatic as you reach the door, with a scent of cereals and hops in the air. The retro style shop sells items with their distinctive yellow label. Different sections for tapas, food, just drinks and the shop. There is even a factory tour if you really are a beer lover. A quirky little place off Las Ramblas is the Bosc de les fades. Tucked into a side street next to the wax museum. This is a fairy-tale place, like being inside an enchanted forest. A more upmarket venue to have tea or drinks is in Gracia. The Café Vienes inside Hotel Casa Fuster Sumptuous is draped in sumptuous velvet and located inside an elegant modernist building, this is a little pricey but worth it for a treat. Barcelona is a shopper’s heaven. Towards the top of Avenida Diagonal, around the Maria Cristina area the El Corte Ingles Diagonal store is one of Spain’s best. In this department store you can find a wide selection of designer brands and cosmetics. Also nearby is L´illa shopping centre. On the ground floor, Spanish boutiques, International brands and footwear. Head down to the basement and discover the posh food market. Lined with sushi and noodle bars. This is a great place for delicious casual dining. For quirky one off boutiques and local designers wander over to Paseo el Born or the Barrio Gotico. Las Arenas is the old bull ring next to Plaza España. 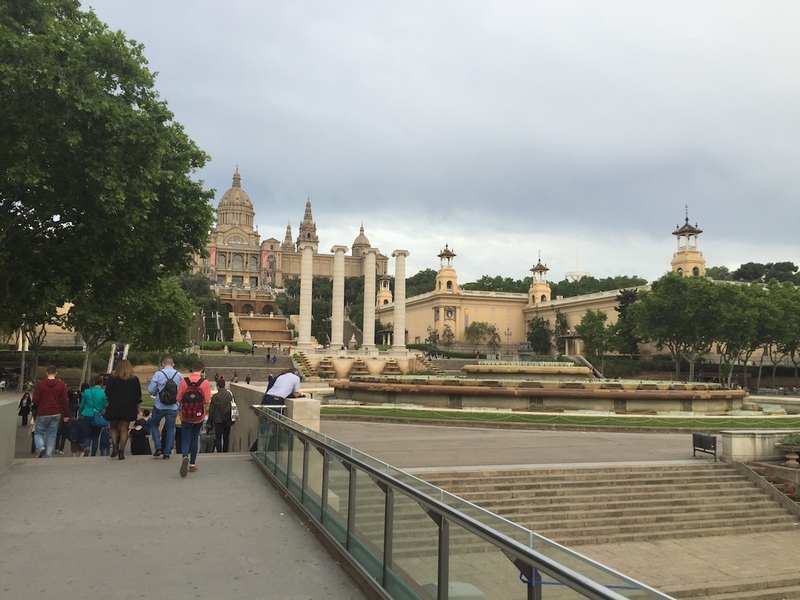 Head up to the top floor for the amazing views across to Montjuic and the Palau Nacional. Inside this revamped building there are shops and restaurants too. 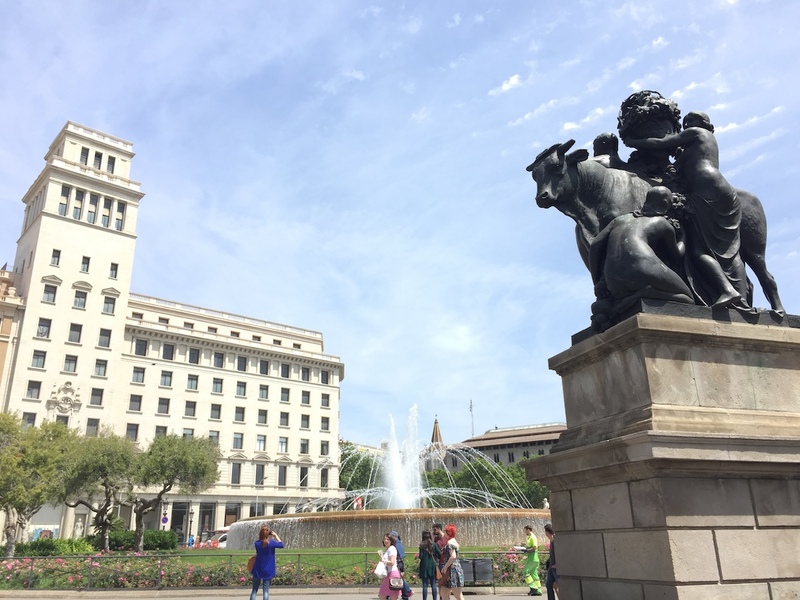 The closest Metro stops are Tarragona and Plaza de España. The best places in Barcelona to see the sun go down are the beaches of course. Look out for the Blue beach bar in Barceloneta and Bambu on the beach at Diagonal Mar – Forum. Other interesting places to watch sundown are the Bunkers del Carmel. This viewpoint high up above Parc Guell looks down over the city and is a great spot to get almost aerial like shots of the city. 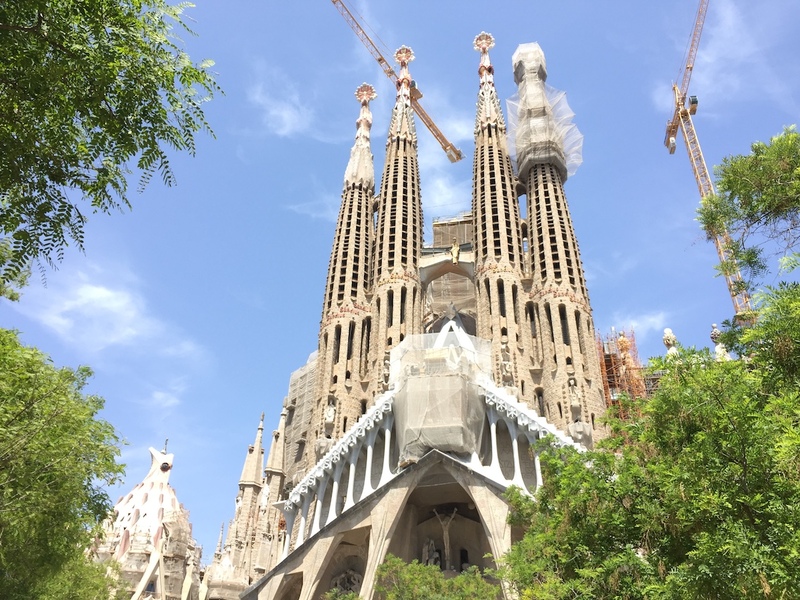 Sagrada Familia, the unfinished Gaudi Cathedral is also another great building to see at sunset. Sit in the park opposite and contemplate the green lake as the sky turns violet and pink. Getting around in Barcelona is best by metro. It’s cheap and fast. The metro network in Barcelona is simple to navigate. There is even a connection from the airport to the city centre. Taxis are a good way to move around if you have luggage or there are several passengers to share the fare. Look out for the black and yellow cabs with the green light on top showing that they are free to flag down.